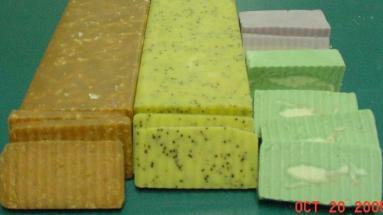 Great way to sample our soaps, Choose from many fragrance and color choices. Bars shown left to right, Cherry Almond w/coconut,Gardenia with organic cranberry seeds,Soft purple(serenity) Green tea with Bamboo, See our complete fragrance choices by clicking the picture. Our slab soaps are made with our 100% natural Shea butter formula, The difference is we may add a fragrance oil or coloring to create the unique blends available.